Mit dieser 3-stündigen Kreuzfahrt entlang der Berliner Wasserstraßen können Sie sich in Berlin ganz durchnässen. Gehen Sie an Bord des Luxusboots, der Krone der Spree, und machen Sie sich auf zu einer Reise durch die Geschichte und durch diese aufregende Metropole. Lernen Sie die Geschichte der Stadt kennen, während Sie die wichtigsten Sehenswürdigkeiten vom Fluss aus genießen, und gönnen Sie sich anschließend ein herzhaftes Zwei-Gänge-Mittagessen mit einem Drink. Nice relaxing afternoon spent enjoying the sights and excellent commentary. Friendly crew fast efficient service and value for money. We had the chicken dish which was very tasty. Been meaning to do this the ast few times we came out and glad we did. Lovely river cruise. We enjoyed our afternoon on the water. It was a rainy day, so we sat inside, which was wonderful. You could see perfectly and be very comfortable. The cruise was great, and you saw so many things from the river view. We had a nice lunch with topped off the tour, even going through a lock, which was very interesting. 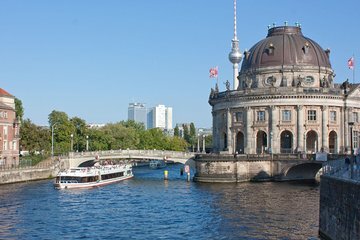 If you would like to sit and relax and see Berlin from a different perspective, I would recommend doing this cruise. We loved it. This was an excellent tour and a different approach to enjoy Berlin. It was definitely worth it and would do it again. I highly recommend it to those who are looking for something great to do in a short visit. The food was awesome and the views spectacular. The cruise was good, the starting and ending location was horrible. My group almost missed the cruise as we couldn't get taxis, even from a major hotel in Alexanderplatz. On the return, we were forced to wait for 45 minutes while we tried to flag down taxis. Great way to see Berlin from their pride and joy - their river. Good feel of the culture, food, and relaxation. So easy to get into running from place to place, pause is good. Easy enough to find using public transportation and walking app on my phone. Staff attentive. Boat had all the amenities needed and German standard of clean! High quality German wine served. This tour was EXCELLENT! Our guide shared his great knowledge of Berlin. He was upbeat and informative. The ride on the Spree River from where we were staying was filled with much historic information, which was just 'up our alley'. We compared what we had seen on the 2 different Hop On Hop Off bus tours. You get a totally different perspective.Lunch was great. We highly recommend this tour. Very enjoyable trip. Very impressed with boat and staff. Relaxing tour, food was ok, not a stand out, probably best to get off on the way back,say halfway as it's just a repeat.